In 1966 the palaces of the Ganda, Nyoro and Ankole peoples were seized and burned, the musicians dispersed or killed and the royal instruments destroyed! The court music was never heard again. Historical recordings by Hugh Tracey in 1950 & '52 – we are so lucky they exist. Featuring the last Ganda royal harpist – the great Temusewo Mukasa – as well as the royal flute ensemble, drum ensemble and xylophone ensemble, and others. From the Nyoro court the swinging royal horn ensemble, and unique royal drums. 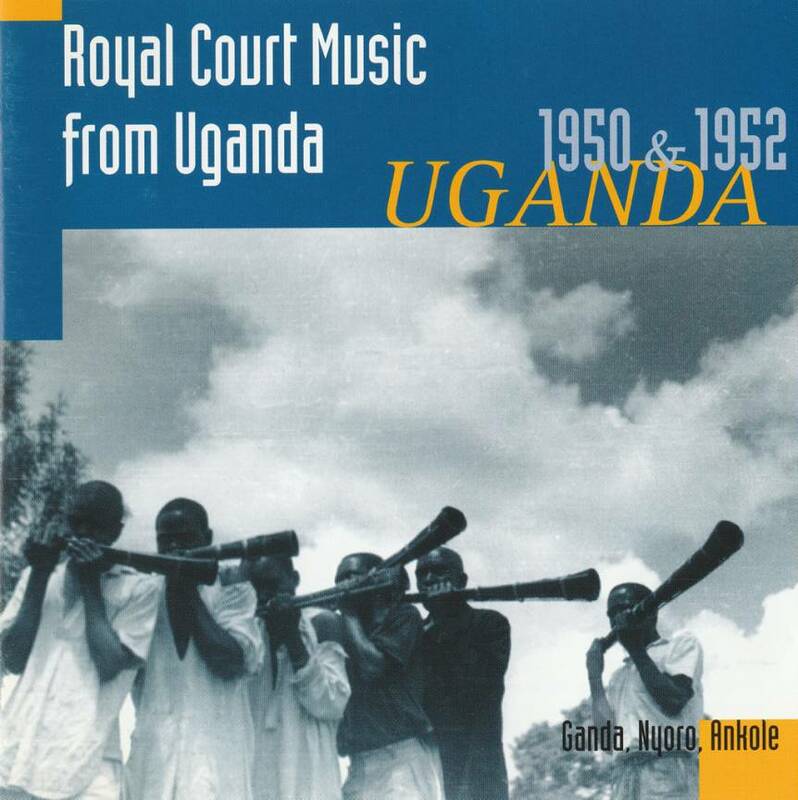 Songs from the Ankole court. Total time: 66'49". 20 page booklet. Tracklist: 1. Okwagala Omulungi Kwesengereza, 2. Gganga Alula, 3. Osenga Omwami Tagayala, 4. Okuzanyira, 5. Asenga Omwami Tagayala, 6. Katego, 7. Kalagala Ebwembe, 8. Nandikulamudde, 9. Bashiibira Malaika, 10. Kyuma, 11. Nsiriba Ya Munange Katego, 12. Sewaswa Kazalabalongo, 13. Oyagala Nkole Ntya, 14. Lulangalanga, 15. Bwemba Nkwagala Nkugamba, 16. Akasozi Bamunanika, 17. Mulamu Namala Ampita Erinya, 18. Irambi, 19. Rwakanembe, 20. Ntajemerwa, 21. Speech By The Omukama, 22. Okuturukya Omukama, 23. Ntimbo, 24. Aramutanga, 25. Kitwekize Kya Winyi, 26. Rukidi, 27. Kyebambi, 28. Kotabijuba/Abagenyi Baizire, 29. Obw'Omukama Gasyonga II Yagwara Ekirungu, 30. Entoro Y'Omuhogo. Rootsworld 1998 (USA): "These recordings have been meticulously remastered, and the sound is wonderful, a testament not only to modern technology, but more significantly to the care Tracey gave to his recordings. They were important works when they were made, and 40 years later their significance is still undiminished. That these recordings exist at all is a miracle, that they are being reissued is a gift."